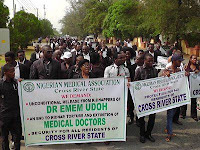 protested in Calabar the kidnap of their colleague, Dr Emem Udoh. Udoh, a senior registrar in the Department of Pediatrics, University of Calabar Teaching Hospital, was kidnapped on Monday in Calabar. The doctors, who wore black, threatened on Tuesday to stop work because six of their colleagues and relations had been kidnapped in the last few months. They had, however, celebrated the release of their colleague, Dr Usang Ekanem, on Sunday. Ekanem, who works in Cross River College of Education Medical Centre in Akamkpa Local Government Area, was kidnapped on December 26. The aggrieved doctors, who protested on major streets in Calabar to the Government House, condemned the government’s approach to abduction of doctors in the state. Nigeria Medical Association (NMA) Chairman Dr Effiong Mkpanam said all hospitals would remain closed until their colleague is released. Mkpanam urged the government to address security challenges in the state. “We are not safe and we want people to know that we cannot go to work because we are not safe. We want unconditional release of Dr Emem Udoh who is a nursing mother and until she is released, all the doctors in Cross River State will sit at home. “Anybody who wants medical treatment should go to the neighbouring states,” he said. The chairman decried insecurity in the state, adding that Cross River is no longer safe for residents and tourists. NMA spokesman Dr Ernest Ochang said doctors in the state would sit at home anytime a doctor or a relation was kidnapped. “The litmus test for any leader is security and safety of its citizens. But when we are not safe, we dare say that the government has failed the litmus test. The government, however, has the litmus test of redeeming itself by ensuring the release of Dr Emem Udoh. If Udoh is brought back today, we will resume work today. But until then, anyone seeking medical attention in Cross River State should go to neighbouring states,” he said. The Secretary to the State Government (SSG), Ms Tina Agbor, said government was working to secure release of the abducted doctor. Agbor noted that Governor Ben Ayade is unhappy about the security situation. “It is unfortunate that soon after one of the doctors was released, another one was abducted, and this time, a woman. I am a woman and right now, the Security Adviser to the Governor is on the streets trying to solve this problem. You did not need to come here to remind us of our duty because we are doing something about it,” she said.